Armin Linke, Kosmaj Partisan memorial designed by sculptor Vojin Stojic i arhitekt Gradimir Medakovic, Serbia, 2009. Socialist Architecture: The Vanishing Act is a collaborative project between photographer Armin Linke and architect Srdjan Jovanovic Weiss. Since 2009, Weiss and Linke have worked together to visit and document selected locations of ex-Yugoslavian socialist architecture in order to document the state that they are in today. The Socialist Federation of Yugoslavia vanished during the early 1990s and was Balkanized into a number of emerging democracies and former Socialist states. Each of these new states inherited monuments, buildings, landscapes, and infrastructures which were constructed specifically for former socialist conditions and representations. After Yugoslavia vanished, most of the inherited architecture was left vacant and in a state of limbo between repurpose and reuse, or continuing as archaeological ruins. 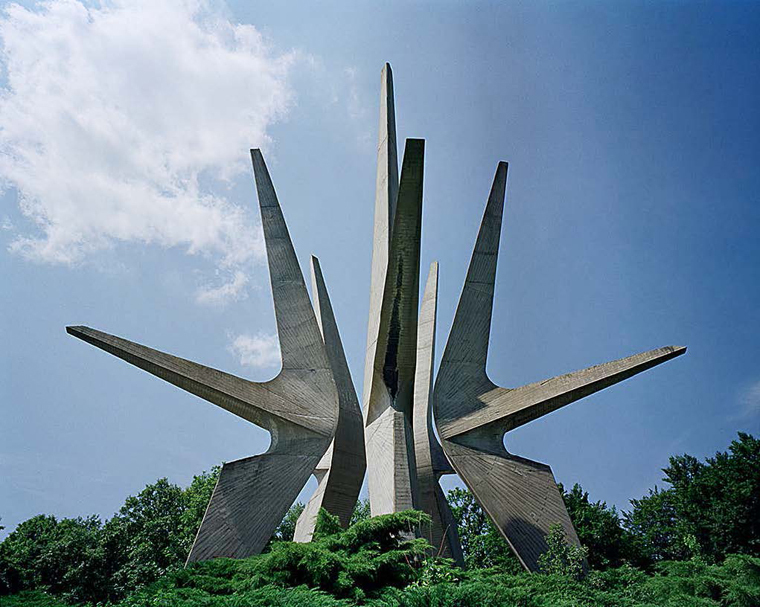 By creating documentation, Socialist Architecture captures the indecision facing three particular emerging democracies today: Croatia, Macedonia, and Serbia, and the distinct effects their undecidability creates on both the spatial and visual experience of the former Yugoslavia's architecture. Armin Linke was born in 1966 and lives in Milan and Berlin. As a photographer and filmmaker he works on a progressively growing archive of various human activities and new natural and artificial landscapes, seeking to document situations in which the boundary between fiction and reality fade and become invisible. He is a lecturer in architecture and basic design at Milan Polytechnic, IUAV in Venice, and ZKM Karlsruhe. His multimedia installation about the contemporary Alpine landscape was screened at the Venice Biennale and at the Graz Architecture Film Festival. He is a guest professor at the HfG Karlsruhe ad at IUAV Arts and Design University in Venice, and a research affiliate in MIT's Visual Arts Program. Srdjan Jovanovic Weiss is assistant professor of architecture at Temple University's Tyler School of Art and founder of Normal Architecture Office (NAO). Weiss has a master's degree from Harvard University, where he studied with Rem Koolhaas, Jacques Herzog, and Richard Gluckma,n and gained experience working before opening his own practice in 2003. His work on preserving public spaces in transition from the Socialist era is best known through designs and activism for Handball Stadium in the city of Novi Sad. His books included Almost Architecture, which explore sarchitecture vis-à-vis emerging democratic processes, and Lost Highway Expedition Photobook, which witnesses the rapid urbanization of southeastern Europe. Weiss was recently selected by Herzog & de Meuron Architects as one of one hundred architects to design a villa in Ordos, Inner Mongolia, to be built during 2010-11. He is currently a PhD candidate at Goldsmiths College, University of London.